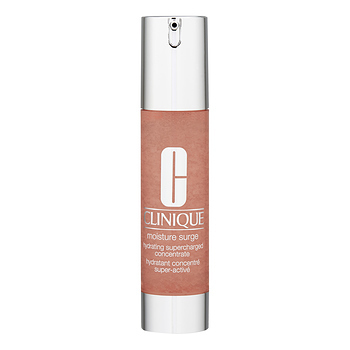 Clinique Moisture Surge Hydrating Supercharged Concentrate has the following features: Supercharged water-gel hydrator instantly quenches dehydrated skin, which is so intensely hydrating, boosting skin's moisture reservoir for a full 24 hours. Liquid-Sphere Technology combines water-binding ingredients with encapsulated antioxidants to help break the cycle of dryness and environmental stress that can lead to premature aging. Lightweight texture delivers refreshing feelings to skin. For all skin types. 100% Fragrance Free. Non-Acnegenic. Oil-Free.